Tony Blair had The Queen. George W. Bush had W.Now Nicolas Sarkozy has The Conquest. The Conquest follows Sarkozy from his work in the ministry of president Jacques Chirac in the early 2000s, to his successful run for president of France in 2007. The pacing of The Conquest is nonstop, which works great with the frantic energy of Podalydès’ Sarkozy. But if there weren’t any hurdles, The Conquest wouldn’t be much of a film. The low hurdles include President Chirac (Bernard Le Coq), who obviously outranks Sarkozy, yet who seems resigned to eventually being replaced by his unstoppable underling. Dominique de Villepin (Samuel Labarthe) is another cabinet minister of Chirac’s, and a powerful, high-ranking member of their center-right party. He wonders why the Interior Minister would travel to China. Perhaps to challenge the Minister of Foreign Affairs (Villepin) for power within the Chirac regime. Villepin, too, seems more like a thorn in the side than a genuine obstacle to Sarkozy’s rise. A bigger challenge is his wife Cécilia’s (Florence Pernel) affair with another man. At first she seems merely frustrated and annoyed with the omnipresence of the news cameras. She’s a valuable advisor, not just a spouse, so her absence is a big deal to Nicolas — not that he lets her absence stop him. But it eventually comes out that there is another man, and at the worst possible time, right before the elections. The Conquest makes an interesting contrast with American political films. For example, it isn’t as cynical as The Ides of March. Podalydès’ Sarkozy is ambitious, but he’s not evil, nor even callous. Where our politicians would be portrayed as allowing the little guy to get screwed, Sarkozy seems to be willing to bargain with the little guy. When a skeptical blue-collar worker challenges him, Sarkozy steps down, shakes his hand, and pushes back. He drives a hard bargain that not everybody can love, but you get the sense that Sarkozy would at least uphold his end of the deal. In The Ides of March, you get the sense that promises and handshakes aren’t even worth the paper they are printed on. Or maybe it’s simply that his wife’s affair gives the audience a chance to sympathize with him. In any case, it’s refreshing to see an ambitious politician whose strategy is to win the support of a broad base. That’s another contrast with American culture. Over here, ambition is associated with the power to cram your policies down your enemy’s throat. 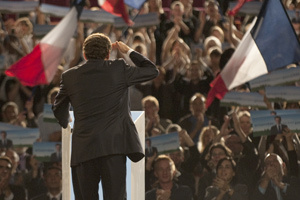 For Sarkozy, the edges of political divisions are blurry. Steal a few votes from the right, plus a few from the left, add them to your solid base and you just might have a winning strategy. I got the sense that The Conquest might have been intended as something of a hatchet job (the film’s French poster is a poke at Sarkozy’s height), but I ended up respecting the politician and the political landscape in France. Maybe the French will see The Conquest as less flattering. To me, it just looks like a drama depicting how it works in France, and it looks a lot less screwed up than what our political films show. The Conquest is a densely packed political procedural. I did manage to keep up, but it was touch and go for a while. If you don’t have a head for politics or French culture, you might feel lost. But for political junkies — fans of The Queen, Primary Colors, and the Italian film Il Divo — The Conquest is a welcome addition from your confrères in France.